There are no current status alerts. The NMCRIS system is operating as expected. What conventions should I use for report Title and Author? What is the coordinate system of the NMCRIS spatial data? Why can't I see UTM coordinates on the NMCRIS map service? How do I change my NMCRIS password? 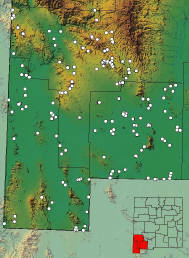 Archaic period archaeological sites in Southwestern New Mexico. Image from NMCRIS GIS Data, May 27, 2011. The mission of the Archaeological Records Management Section (ARMS) is to house, maintain, and protect all records of archaeological investigation in the State of New Mexico. ARMS is also responsible for protecting the security of that collective information, while providing access to the same to qualified users. ARMS administers the newly-enhanced New Mexico Cultural Resources Information System, the largest automated cultural resources database in the United States. ARMS administers the newly-enhanced New Mexico Cultural Resources Information System (NMCRIS), the largest automated cultural resources database in the United States. NMCRIS provides tabular and geospatial information to qualified users regarding cultural resources investigations, archaeological sites, historic structures, and state and national register properties. ARMS is supported by federal and state agencies through Data Sharing Agreements and by user fees from Cultural Resource Management contractors working for private industry. University partnerships provide scholars access to the massive research potential of NMCRIS and the paper records stored at ARMS. The NMCRIS Users guide, which provides guidelines for submitting archaeological and architectural records was updated in 2018. Download the User's Guide. For information about appointments, collections, and research please refer to our Visitor Guide.